Who Were The el-Bakraoui Brothers, The Brussels Suspects Thought To Have Died In The Attacks? According to Belgian police, two of the Brussels bombing suspects were brothers Khalid and Ibrahim El Bakraoui, BBC News reported Wednesday morning. 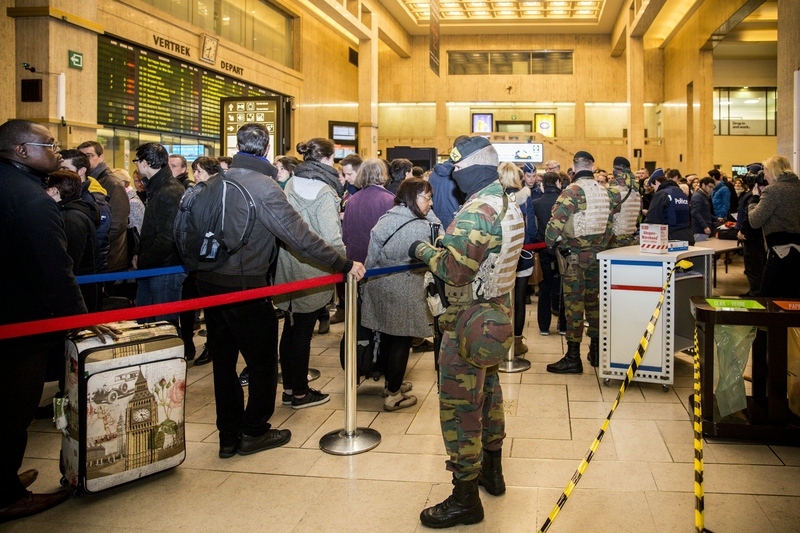 Shortly after Ibrahim detonated his suicide bomb in Brussels' international airport in local Zaventem, Khalid bombed the Maelbeek metro station. Both have had criminal records for the past several years and were known by Belgian authorities. Khalid, who has spent time for carjacking in 2011, was wanted for undisclosed terrorist activities by the International Criminal Police Organization (INTERPOL). Though Belgian media sources mistakenly reported they had arrested third suspect Najim Laachraoui, he remains the target of an intense manhunt. The fourth suspect — a man in the far left of the photo taken from airport CCTV footage — has not yet been identified. Both El Bakraoui brothers are believed to have died in the bombings. Both were Belgian citizens born in Brussels. Both Ibrahim, who was 30 years old, and Khalid, who was 27 years old, had spent time in prison for various offenses. In 2010, Ibrahim was involved in a robbery and shot at police with an assault rifle. According to NBC News, he was sentenced to nine years in prison for the incident. In Belgium, the possession of automatic assault weapons is illegal and an individual must be granted special permission from the government to own a semi-automatic gun. Khalid was also involved in the illegal automatic weapon market. In 2011, he was arrested for owning Kalashnikovs (AK-47s) but was ultimately charged with "carjackings" instead and sentenced to five years in prison. Ibrahim's address was raided on Tuesday following the attacks and police found a letter he wrote, expressing how he feels cornered and unsure of what step to take next. Belgian federal prosecutor Frederic Van Leeuw read a part of the letter aloud. I don't know what to do. I'm looked for everywhere and I might even find myself in a jail cell. Khalid's apartment, located in the Forest section of Brussels, was raided on March 15, exactly a week before he and his brother carried out the attacks that killed 34 people and injured hundreds more. Khalid avoided arrest but the raid did lead to the arrest of Paris attack fugitive Salah Abdeslam and the sniping of ISIS affiliate Mohamed Belkaid. The Guardian reported that both brothers were affiliated with the ISIS conspirators who carried out the Paris attacks. One of the brothers had rented out the house in the Belgian city of Charleroi, where two of the Paris terrorists met up before heading to France in November 2015. Additionally, one had contributed weapons to the ordeal.